My only experience with Winchester’s other work was “The Professor and the Madman,” which is a biography of the Oxford English Dictionary. 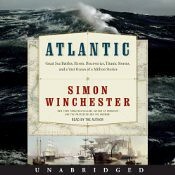 Based on that book, I was expecting more in the way of narrative structure in “Atlantic.” Winchester isn’t really telling a cohesive story, however, he is relating the vast histories of an ancient body of water. And, in fact, the lack of narrative thrust ended up not to be a problem. Winchester’s structure seemed very professorial to me, perhaps a semester’s worth of lectures, linked by the general subject matter, but not necessarily continuous from day to day. Like the best professors, Winchester is full of amusing anecdotes and fascinating tidbits, so that the reader and listener absorb information almost without realizing. I never knew that an ocean could be so interesting, and I am quite anxious to explore some of the aspects Winchester discussed more fully. Authors narrating their own work is usually a red flag, but Simon Winchester takes on the task with gusto. In fact, if I didn’t like his books so much, I would suggest that he try a new career path in narrating audio books. As with the writing, the narration style was very professorial, everyone’s favorite history professor, the one who was completely caught up in his subject, but at the same time didn’t take it to too very seriously. Just an absolute pleasure to listen to. I’m sure this would be fabulous in print, and is probably aided by great maps and figures, but Simon Winchester’s narration is engrossing. What higher praise can I give a work like this than it inspired me to explore aspects of the topic more closely? Highly recommended. I usually see a red flag when authors narrate their owm work too. The only time I thought it went well was when a commedian narrated their own book – that made sense. I’m glad that this one went well for you! I just loaded this on my iPod, at the recommendation of Candace. It is so off my radar, but I trust you all. I have wanted to read this book and I keep forgetting about it. Must see if I can get it at the library. Thanks for the great review! There are definitely exceptions, and Neil Gaiman is a major one. He’s up there with Simon Winchester in the “if I didn’t like his books so much, I’d suggest a career change” list. I’m always impressed when an author does a good job reading their books because so many don’t. Any book that makes you research is a good one! Oh that is high praise, indeed! I love to hear that!